If you’ve ever spent some time in inner city Melbourne or in country towns like Geelong, Ballarat or Bendigo and you’ve a keen eye for architectural heritage and history, you may have appreciated the beauty and craftsmanship of some of Australia’s most beautiful ironwork. From balustrades and verandas to sturdy fences and trusty wrought iron gates, history is literally on your doorstep if you take the time to look. But have you ever wondered how these stunning designs were created, manufactured and installed? Let’s take a look at some of the history of ironwork in Australia. The idea of ornamentation on homes actually originated from England, however the forms and patterns of cast iron ornamentation varied greatly between countries, and in Australia, even from state to state. In terms of the history of ironwork in Australia, it became fashionable to use cast iron when manufacturing ornamentation, as it was cheap to produce, and after the Victorian Gold Rush which began in 1851, the demand for decorative balustrades and upmarket lacework especially on terrace houses, exploded with the increase in population. Many miners (or merchants as they were known) who had profited greatly from this gold rush period relocated to inner city in areas like Ballarat, and lived in upmarket houses in order to complement their newfound wealth. And many of their large mansions were built using cast iron, especially for external usage. Ornamental designs differed from home to home, and included things like the ‘Boston fern’ that first appeared in the late 1880’s in and around Melbourne, and the sulphur-crested cockatoo that was seen around many of the country towns in New South Wales. The kookaburra also featured in ironwork, including in the Melbourne suburb of Prahran and in Ballarat in the Central Highlands region of Victoria. Superb examples of both balustrades and cast iron lacework can be seen on many properties around this area, which are today protected by National Trust preservation orders. Unfortunately, the cast iron decoration boom ceased around the end of the 19th century as a result of a number of factors, including the introduction of new architectural styles like federation-style homes, and the Depression and subsequent land boom collapse in 1893, which meant there was little money for building. During the period from 1890 to 1900, many wrought iron gates and fences were manufactured using cast iron, which required a fair bit of skill and an intensive amount of labour. The astounding part of producing a cast iron panel in these times was that it had to be carved from wood prior to its pouring at the foundry, which would be an extremely costly exercise if done today! Often original castings from England were also brought out to be used as a pattern, which is why many English designs can be see on Australian homes that were built around 1900. The main advantage of using cast iron was that it was durable when cast, however it did have the disadvantage of becoming very brittle and shatter, especially over time. However, many of these wrought iron fences still stand today in some inner city areas of Melbourne and in Victorian country towns like Ballarat. A stunning example of the introduction of cast iron from overseas can be seen in the Corio Villa on Geelong’s waterfront. Manufactured in Edinburgh, Scotland in 1855, it was exported to Australia and can be seen on the property’s inside and outside walls and on its verandah. Thought to be one of Australia’s most important heritage buildings in terms of international significance, it was shipped to Geelong in boxes by iron founder Charles D Young and Co. Not long after it was exported, the factory burnt down destroying the moulds, and many people believe that due to the fire, Corio Villa may be the only example of this type of model prefabrication in the world. 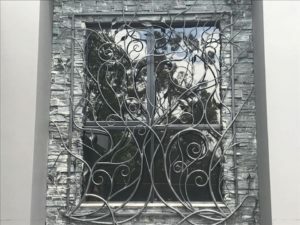 One of the major factors of the history of ironwork in Australia is the registration of iron lacework, balustrade designs and other cast iron pieces of architecture, which began in 1870. Design registrations were part of an overall Commonwealth Register that included registrations from all states and territories in Australia. Approximately 350 designs were registered from 77 foundries, the majority of which were from NSW and Victoria, however, there were some received from both Queensland and South Australia. If you are interested in this part of Australian ironwork history, these are now lodged in Canberra and are available for viewing at the Department of Science and Technology. Whether you’re after a wrought iron balustrade for a deck, balcony or veranda, Dean-Wilson Iron’s robust solutions include a protective coating and an impenetrable core, meaning they’ll last a lifetime. With our blacksmithing background, our team can handcraft both indoor and outdoor balustrades to suit your design preferences, from regal spirals bellow a polished timber staircase railing to symmetrical iron balusters as part of a Mediterranean style villa. Wrought iron never goes out of style, adds a sophisticated touch to any property and it can add value and a beautiful ‘old world’ presence to your home. We design, manufacture and install all of our wrought iron balustrades, and ensure that all our designs comply with the relevant building codes and specifications. And unlike timber and aluminium that can rot and rust, and glass that requires constant cleaning, our iron railings and balustrades will not only stand the test of time, they’re virtually maintenance free! After your own piece of unique ironwork? Contact the experts at Dean-Wilson Iron on 3814 0076.